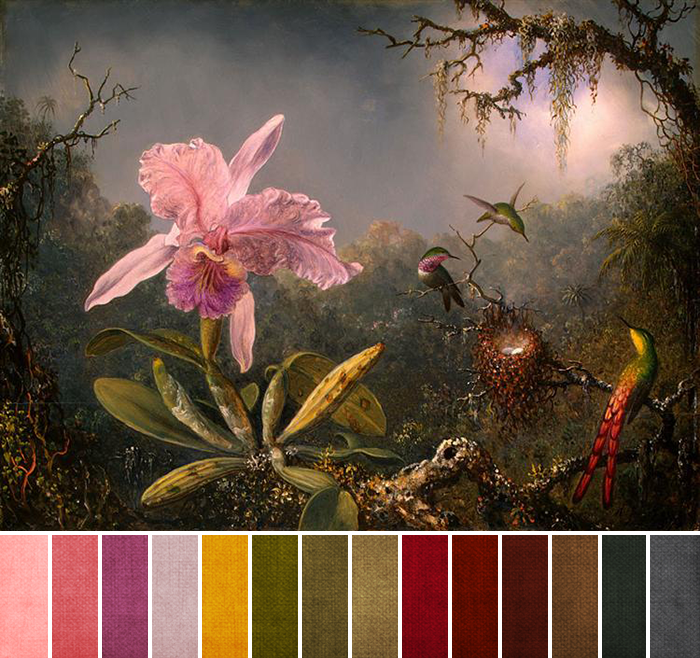 Out of all of the challenge palettes we've had this year, Cattleya Orchid and Three Hummingbirds by Martin Johnson Heade might be the one with the most colors. It's definitely the one with the most number of color swatches I've ever shown! Normally, I aim for eight to ten color swatches for our monthly challenges (you probably noticed), because that feels like a good balance. Too many, and it starts to feel overwhelming. Too little, and we can't really capture the spirit of the painting with colors. With this painting, though, I felt we needed the extra colors to tell the color story. To avoid feeling overwhelmed, keep in mind that the bulk of the shades we see come from red, orange, yellow, and green, and most of those are going to be darker, somewhat muted shades. Aside from the flower, the birds, and the hint of sunshine peeking through, Cattleya Orchid and Three Hummingbirds is pretty moody, so keep that in mind as you choose colors and beads for your designs this month. The trick to using this as an inspiration is to focus on just a handful of colors that call to you, rather than trying to work with all fourteen. If you're liking the moodiness, stick with the swatches on the right. If you like the contrast between light and dark, pull from the swatches on the left and middle, like maybe the shade of light pink against the dark green (which works because they are complements!). As for specific colors, choose different shades of olive green and warmer browns with red or orange undertones to capture the jungle/forest. Those are the two predominant colors, along with darker shades of gray. The rest - the pinks, purples, yellows, and reds - are just touches here and there against the dark green background; you can use them as you like. Your turn! Which swatches are you feeling this month? I am loving the rosey shades teamed with the greens and the muted grey. Fabulous job representing all the colors, Brandi!